One of my readers requested a post about ocelots. I didn’t know much about them, but have enjoyed learning about these beautiful cats. They have beautiful coats, with yellow fur and large black spots which gives them excellent camouflage when hunting. Their lovely fur meant that they were hunted a lot, with over 200,000 hunted every year for their coats. They were in danger of becoming extinct about 30 years ago, but now they are protected and have recovered so that they are not endangered any more. They are excellent hunters and will catch and eat a wide range of prey, including rodents, rabbits, birds, lizards, fish and even turtles, armadillos, crabs and small deer. Ocelots hunt almost exclusively at night and have excellent eyesight to help them find their prey. They are found in jungles and forests throughout Central and South America and there is even a very small population of about 100 living in Texas, USA. 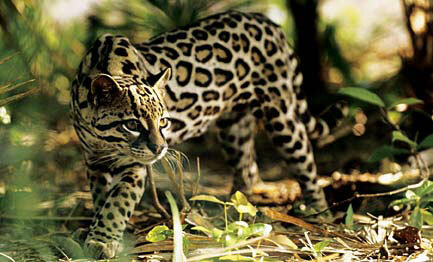 Are there any other interesting facts that you would like to share about ocelots? Where did they originate? Was told Upstate NY area.